Edible flowers are frequently for sale at farmer’s markets but most people are hesitant to take the plunge and actually use them in cooking. 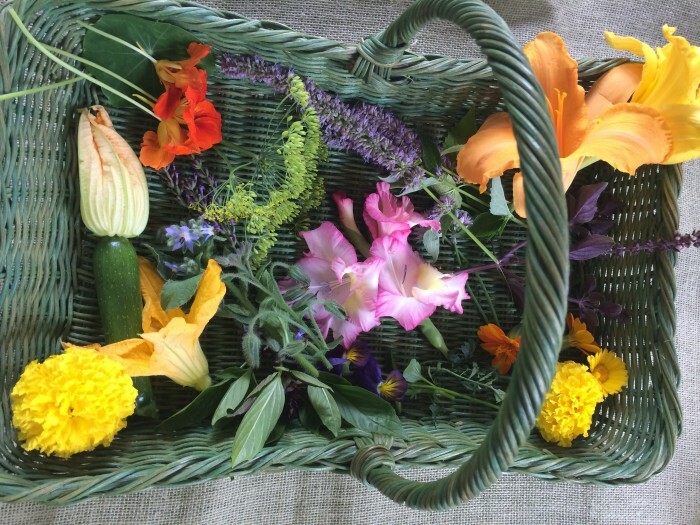 Garnishes – yes, but actually eating flowers??? For most people that is a different story. But flowers can add a lot to the flavor as well as appeal of a dish. Go to Squash Blossom Latkes to see what you can do with squash blossoms. Also, go to African Blue Basil to check out this great flower that makes a wonderful pesto. All basil flowers are edible. 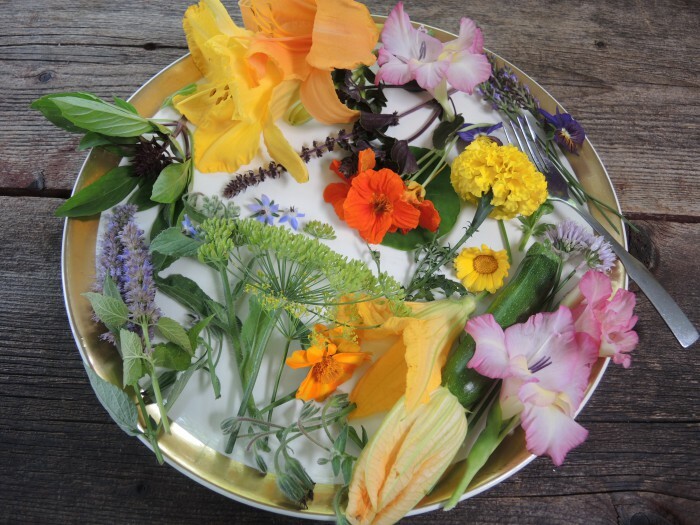 Edible flowers definitely add taste and flavor to a dish. Bean blossoms actually have a beany flavor. Nasturtiums, one of my favorites, have a peppery flavor similar to watercress, and their pickled buds can be substituted for more expensive capers. True blue borage tastes like cucumber, and pansies have a lettuce like taste. For a crisp butter crunch lettuce taste, try daylilies. Maybe that is why deer like daylilies so much. Sprinkle edible flowers in your green and fruit salads for a splash of color and taste. Use in flavored oils or vinegars, like chive blossoms in vinegar which gives it a pretty pink blush color. You can use them in salads, teas, garnishes, ice creams, etc. Lavender ice cream anyone?? It is delicious! Use organic blossoms when you can. If you can’t find them, then be sure to wash the flowers thoroughly. Never use non-edible flowers in your food as guests will think that they can eat it. 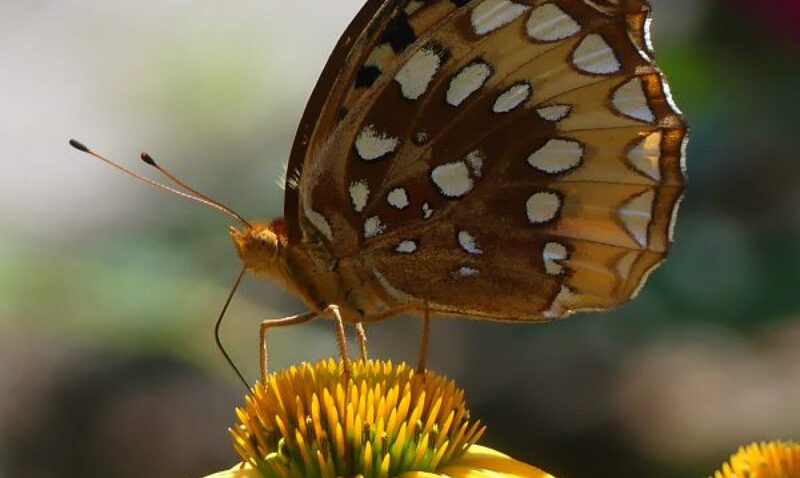 Poisonous flowers abound in your garden and be careful what you use! 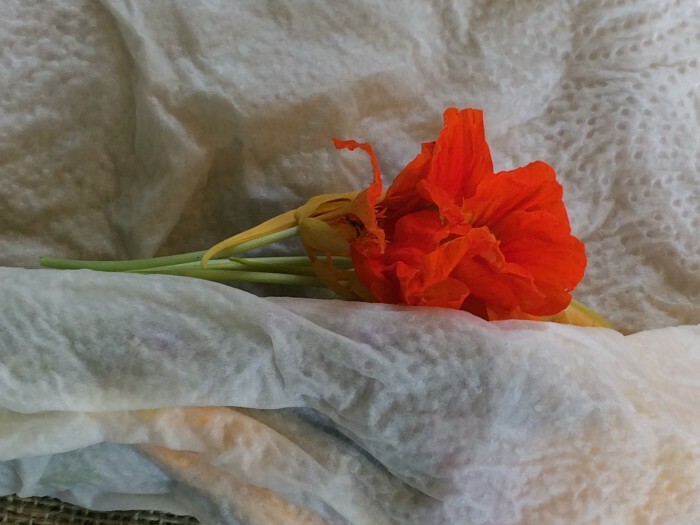 When you pick your blossoms, keep them fresh by rolling up in a moist paper towel and keep in the refrigerator no more than a few days before using. Beautiful, and so informative! I love making brownies with lavender in them, but I look forward to making edible floral ice cubes. Those look beautiful and are sure to make a statement! Thanks, I will have to try the brownies. Nice meeting and talking with you at the fling! Loved the list of flowers. It was surprising how many more there were than I expected. Pinned them. Thanks. I love african blue basil but it has a rather strong flavor and I’m not sure I would want to make pesto with it! I do use it (judiciously) in salads with things like cucumber or avocado, where one might use oregano but giving a different flavor. It is strong, but I love hot peppers and spicy food. So, maybe it is a taste thing.